Dream: I am in the food court of an airport lounge. As I walk through the busy area I spot the four guys I originally did Gringo Records with back in the day. They are huddled together around a table where they talking between themselves. Happily I sit down with them but to some extent I feel frozen out. In comparison I appear to be something of differently developed person to those guys, happier and dare I suggest more adult and professional. When I awaken outside the snow has all but gone now. It is however still chilled with it but in theory it should be easier to drive now. In the end my daily commute turns out to be a lacklustre journey devoid of anything interesting to note. I think with these mornings being so dark I just try to keep my head down and snag some sleep. Once I get to Liverpool Street as I board my tube across town again I spot the Bellalike. Her expression makes her look like a mute person. Today I get into work bamboozled. Off the back of yesterday I no longer really know what I am supposed to be working on at this time. Are the November accounts for the new company now been put to bed? Can I get started on the December ones before it gets too far into the month? As I step into the office the angry boss and the posh boss are in the middle of what seems to be a very heated discussion. 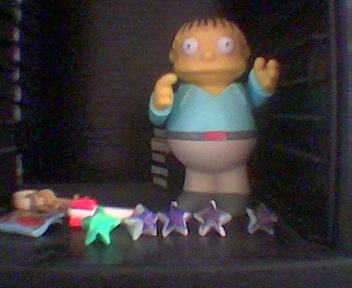 It is uncomfortable and unnerving; with this even I begin to question the future of the company again. In the end I find myself once more scrapping around and changing the management packs, dotting Is and crossing Ts doing a thorough review of the accounts and controls, being afforded the time to do so in a bigger degree than usual. I had originally expected to arrive into work to an email from the consultant but surprisingly (and thankfully) it isn’t to be. Now I am feeling suspicious and paranoid as to why he has not got in touch. Does to this now mean he is about to make another surprise appearance? Elsewhere when the dust settles my boss begins badgering me for VAT figures but I can only produce these I can roll November and begin work on December, something I suspect the consultant is not keen to do as supposedly he is sending some journal adjustments over to me. Soon it is lunchtime and with it I go for burger and chips in cavalier fashion. 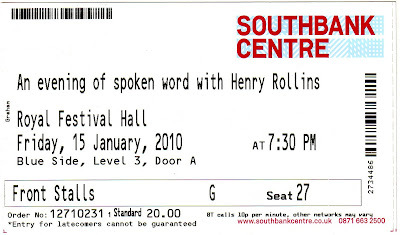 In the afternoon Mark gets in touch for the first time this year asking if I am going to see HENRY ROLLINS tonight. As ever with him it appears that he has stepped into a spare ticket and some pseudo date with a lady. He doesn’t sound very grateful for the opportunity. I respond in the affirmative though and we hatch vague arrangements to meet up at the Southbank allow the meeting time of 7PM still leaves me with two hours to kill beforehand. At 3PM the boss comes in to review the VAT with me. In scary fashion he proceeds to make some startling and terrifying adjustments in order to paint a prettier picture. This is the game is what is known as “window dressing.” Still he is happy and you know a happy boss makes for a happy job (generally). Thankfully 5PM soon comes around. As I leave the building the IT Guy grabs me in the hope that I’ll be able to help him with company accounts next week. We have a problem in so far that the dubious adjustments that I suggested last year as a gesture to paper up the cracks were not reversed in this period so now the issues (and shortfall) have doubled up. I don’t know what to suggest to this guy. Tonight I head straight for Oxford Street with view to getting Justin a birthday present or two. As I exit Bond Street tube station I pass Danny Baker walking in the opposite direction obviously on his way home. I always come close to bursting whenever I see my heroes. This is a good omen for tonight and indeed the weekend ahead. I hit Oxford Street with determination. I have decided to get Justin Entourage season 1 on DVD, which subsequently is shockingly out of stock in the Bond Street HMV. Undaunted however I plod on to the big HMV on Oxford Street where I find it. Additionally I also buy him the Danny Baker football DVD which feels a mere snip at £6, especially considering that I paid £14 for it just before Christmas. My streak of success continues as I manage to change dates for my Brian Gittins ticket at the Soho Theatre next month. This means now I will be able to see Billy Childish at the ICA. Invariably I wind up in Fopp where bargains now feel light on the ground as it begins to resemble an HMV sale more than ever. Eventually I get to Waterloo and onto the Southbank. As ever there is a real buzz attached to proceedings and surroundings and these days this is my favourite place to be in London. If I could spend every Friday night doing something here I would not be unhappy. While waiting in the foyer of the Royal Festival Hall a crowd gathers while a band plays in the centre of it. I don’t recognise the band and to be honest I don’t necessarily want to. As I hang around I notice the Australian dancer manager at one of our site, recognising him from the bowling night when he was trying to hit on The Girl. I’m not quite sure who ignores who on this night, perhaps it was mutual. Personally I found the guy to be a slime though while he probably found me to be an immature prick. When Mark finally turns up it is almost stage time. We grab a quick drink before he begins to start stressing over the fact that his “date” (or rather pseudo-date) has not turned up and she has the tickets. He seems horribly blasé about it all, dismissive from the start. I can’t help but find this all disheartening. 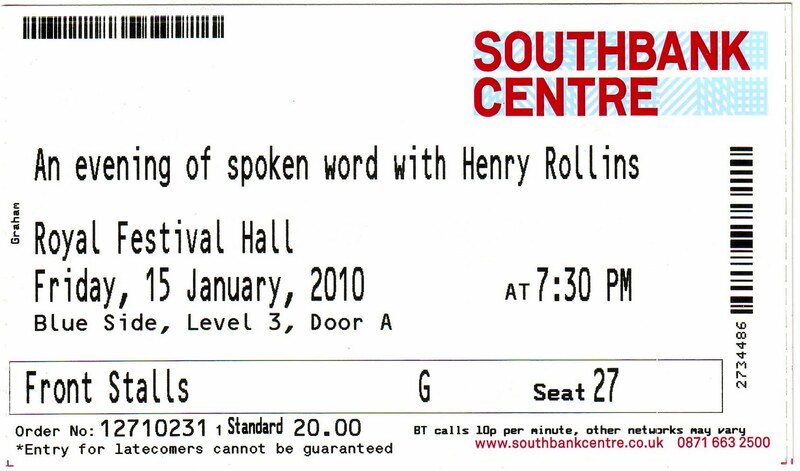 Bloody hell, just what I would do in order to meet a lady that invited me to see HENRY ROLLINS. Some people have it too easy. My friend is still waiting as I head off into the Royal Festival Hall to take my seat. As I sit down next to me is an awkward looking lad and while he doesn’t look like me he definitely reminds me of myself when I was his age and I came up to London on my own for the first time to check HENRY ROLLINS out back on 5 January 1996. I cannot believe that is 14 years ago now. Tonight HENRY ROLLINS still cuts the mustard to the Nth degree. His performance literally howls with enthusiasm and positivity as his stories take the shape of some kind of indie rock travelogue, almost like a punk Bill Bryson. Within his messages comes one of the few liberal voices that isn’t cheesy, that has some kind of vitality behind it and serves to inspire and push a person forward. There are no complaints, just more illumination as it all serves to be life affirming stuff. As ever he is gracious in his delivery, thankful for an audience so open to his delivery and respectful of his words. This feels like routine now as ROLLINS states how excited he has been about doing this date and how there is such prestige attached to this show. Tomorrow night he will be in Manchester like me (“which is a tough town”) but tonight he is playing the centre of the universe. With the ball rolling he enters into a story how he was invited to do a college graduation speech, doing so in his trademark ferocious manner. As a person that has been quite vehement in his criticism of college students in the past it sounds as if he delivered it in strident force, delicately picking away at what the might become and trying to steer them into what they should become, trying to mould the youth (the future) in his own way. Basically in another words he shouted at them with eloquence. Suitably impressed by the whirlwind he talks of how the scholars suddenly change their opinion of him, zero in with a sense of appreciation previously missing. Here, much as with life, it would seem is a person raging with passion being used and directed in a positive manner. It suddenly seems that we are catching/viewing ROLLINS in a good place at this time. His stories scream of more positivity than ever as his adventure rages, taking in more parts of the globe than ever before. He also unsurprisingly is pretty proud as punch that Obama is now steering the good ship America. Originally coming from Washington DC this helps him launch into a story of spending the historical night in his hometown with Ian Mackaye and family, indulging in the monumental celebration that came with. This then in turn develops into an anecdote of he and Mackaye then going down to the legendary 9.30 Club to check out Bad Brains where it would seem H.R. is now batshit crazy. As ever thankfully his punk/music roots are not far from his stories. From here his travelogue takes him all over Asia including the site of the Bhopal disaster where he offers up some kind of mission impossible adventure of him climbing over walls, diving past armed guards just to get a view of a covered up disaster scene. Towards the end ROLLINS reveals that he now has a girlfriend. It feels like a bombshell. For years this guy has been everyone’s single friend, a beacon of not needing a significant other and now with this announcement it feels as if he has sold us out (of course hasn’t). With this you now fear the angriest old man is about to mellow. He sounds optimistic for the future now in way that would not have been/thought conceivable when I first saw him 14 years ago. Quite frankly it terrifies me these days to think that I am now older than he was when he did his infamous Reading 92 set. The night ends in striding and positive fashion which garners standing ovations from many sections as our fiery pep talk for the evening comes to a close and we now have new commands to take with us out onto the streets. In ROLLINS we have a lefty hero with thrust in a way that is not cheesy. A rare feat. Personally I come away feeling invigorated from genuinely life affirming material. As I leave I catch up with my friend and meet his lady friend who appears to be really cool and very pretty. She heads off to the toilet as we discuss plans from here onwards. During our brief chat my friend just will not say that he enjoyed the show it seems. For me this cheapens the evening, quickly brings me down from what was such an enthusiastic climax. I can’t help but resent my friend for such negativity, like Black Flag rise above and not sink to the level of others. Swiftly, with the girl still with her knickers around her ankles, I head back to Waterloo and over to Liverpool Street via London Bridge and Moorgate. Somehow I manage to hop aboard a train not full of rowdy pissheads. Such things are always a bonus on a Friday night. Eventually I get back to my flat still feeling slightly down, other people ruin everything. On TV tonight there is a choice of three movies of which I fall asleep into Judge Dredd. Ordinarily this would be gross misconduct but tonight I spot the Ian Dury cameo and I find myself drawn in. Topical. With an early start threatened for tomorrow I get to sleep ASAP.